Following the 20,000+ mph return of the Exploration Flight Test -1 (EFT-1) Orion last week, the spacecraft is enjoying a more leisurely series of transits. After completing the ride back to port in the belly of the USS Anchorage, Orion is taking a cross-country road trip that should result in her returning to the Kennedy Space Center (KSC) by Christmas. The debut test mission in space for NASA’s Beyond Earth Orbit (BEO) crew vehicle was a roaring success. The launch, during the second opportunity, atop United Launch Alliance’s Delta IV-Heavy marked the beginning of a flawless mission that tested numerous critical systems, allowing for a huge collection of data that will fed into next year’s Critical Design Review (CDR) for Orion. The battle for hearts and minds was also won, with NASA’s streaming of the mission bursting at the seams with bandwidth bottlenecks and traffic jams, resulting in a – at times – shaky webcast. The NASA mission also trended as the number one subject matter, worldwide, on Twitter several times during the flight, something that is almost unthinkable in this era of public fascination with reality TV stars and tabloid nonsense. While the public and seasoned space flight fans celebrated in the success of the mission, most of the latter were more than aware of the challenges that still face the spacecraft. As always, NASA is at the mercy of political direction. That direction – despite NASA’s PR drive to associate EFT-1 as on “the path to Mars” – is still heavily undefined. 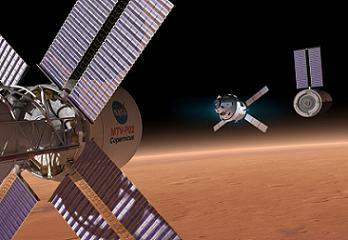 Officially, crewed missions to Mars have only a schedule sound byte of “sometime in the mid 2030s”. Internally, the Design Reference Mission (DRM) documentation cites such missions are “To Be Determined”. Several large scale studies have been created over the years, but none have become a resolute political baseline. The cold hard reality of footsteps on the Red Planet is centered around the need for many billions of dollars, the support of several consecutive US presidents, a collaboration of international agencies and commercial partners, along with major advances in human space flight technologies. How much EFT-1 will be seen as a pathfinder for such missions is questionable. However, it was the first space flight of the vehicle that will have a role in transits to Mars, at least for launch, potential transfer between habs and entry, although it will only be part of a very large and complex puzzle. The Orion used during Mars missions will also be somewhat “different” to EFT-1 Orion. The Orion that tasted space for the first time last week sports a heat shield that would not be able to withstand the higher velocities involved in a return from a Mars mission. Regardless, the mission – and safe return of Orion – will provide vital data that will fed into the next Orion – for Exploration Mission -1 (EM-1) – which is already undergoing construction at the Michoud Assembly Facility (MAF). “The 1,200 on-board sensors will provide us an ocean of information about everything from the effects of space radiation on our avionics to the environment inside the crew cabin,” noted Mike Hawes, Lockheed Martin vice president and Orion program manager. 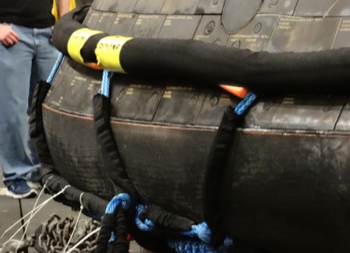 Additional data has already been gathered after Orion was recovered from her splashdown point in the Pacific Ocean. Engineers – working on the Orion once the Anchorage had steamed into port in San Diego – removed samples of the heat shield to examine its performance and ablation rates during re-entry. The samples, along with select data recorders, will be brought to nearby Lockheed Martin facilities for processing. This analysis will help the technical team get a head start in determining how to optimize the development of future heat shields. Orion’s heat shield is an Avcoat and Phenolic Impregnated Carbon Ablator, with a technical name of AVCO 5026-39 HCG (Filled Epoxy Novalac in Fiberglass-Phenolic Honeycomb). It clearly did its job, as Orion successfully negotiated her first entry-interface and passed through peak heating without issue. The only noticeable tile damage appears to have come from the ropes used to secure the vehicle. 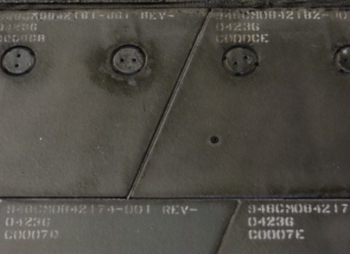 These tiles have their own history, with the first of the EFT-1 set manufactured in 2012, known as Tile 875-1 on Panel H of the backshell. Originally, the baseline for the backshell was a SLA-561V material with plasma sprayed aluminum coating for on-orbit thermal control. However, the AETB-8 tiles are deemed to provide more mass-efficient MMOD (Micro-Meteoroid Orbital Debris) protection. Notably, the photos show at least one of the tiles sports a pre-drilled hole to prove the math behind claim. This is understood to be a method employed to simulate how Orion would deal with a MMOD strike – one of the major threats to a spacecraft when travelling in space. Orion can now look forward to a victory tour across the United States, after she was loaded onto a special truck for what is an estimated two-week trip across the country to Kennedy Space Center in Florida. Once she arrives, NASA and Lockheed Martin engineers will disassemble the vehicle and thoroughly examine its structure, computers and instrumentation. This process should be completed by March, allowing for Lockheed Martin to provide a complete data analysis report to NASA, which includes information about the vehicle’s performance and recommendations based on the results. This is part of the company’s contract with NASA for this mission. EFT-1 Orion herself will live on, changing call signs to the Ascent Abort (AA-2) Orion, allowing for a key test of an active Launch Abort System (LAS). ATK provided a passive LAS for the EFT-1 mission, which performed as expected during the mission, bidding farewell to the stack during ascent. The AA-2 test is scheduled to occur after the EM-1 mission, ahead of the debut mission with a crew riding in Orion. While the EM-1 uncrewed flight will utilize another inert LAS, the AA-2 test will use an “operation design with live propellant”. 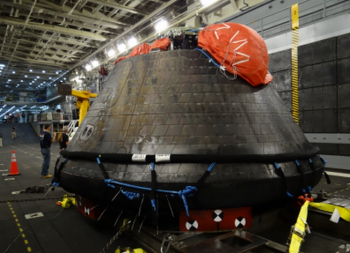 (Images: Via L2 SLS and Orion sections – including exclusive – on board, pre-media event – photos (several hundred MBs)).